Tim Burton’s ‘Alice in Wonderland’ film is released March 5 this year and from this clip, it looks a lot of fun. I’m not keen on Alice’s off the shoulder dress though – is there any need really? The visual effects look very interesting though. I found the floating Cheshire cats floating head on the trailer quite frightening. But so it is in the book, as it fades away and only the grin is left. Surprised to see Tweedle dum and Tweedle dee in the new film though as they are charaters from Alice though the Looking Glass. So it would seem that both books and characters have been lumped together. But, back to the teapots. 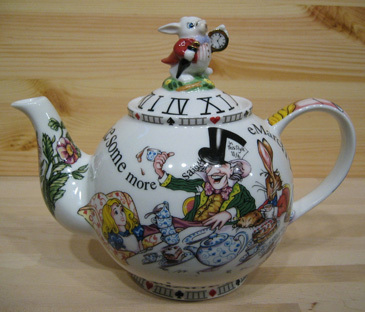 It is easy to see why the teapot serves as a vehicle to Alice. 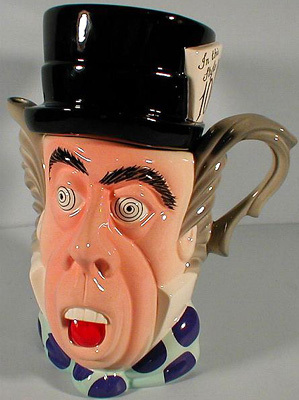 The teapot is central to the tea-party where we get to meet some interesting characters – especially the Mad Hatter. 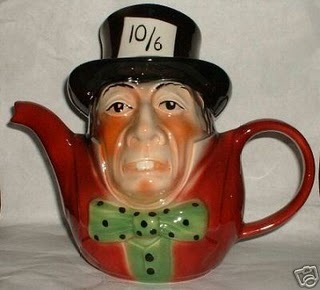 I love the wild Mad Hatter teapot by Paul Cardew. 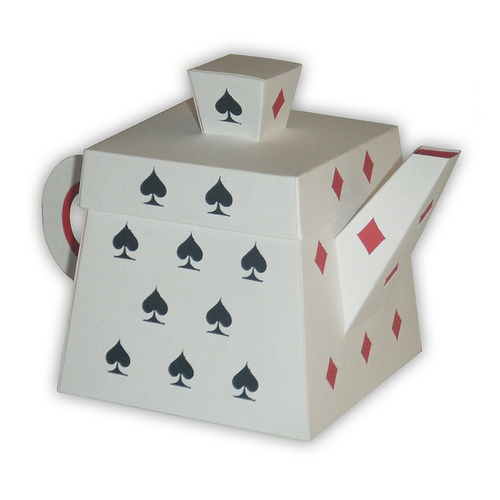 Cardew seems very fond of Alice – he’s done lots of teapots with using the Alice theme. 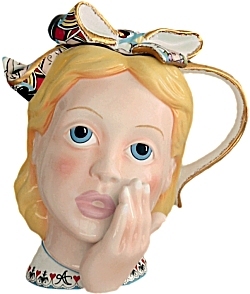 This unusual teapot has ‘Drink Me’ on the side – obvious really! 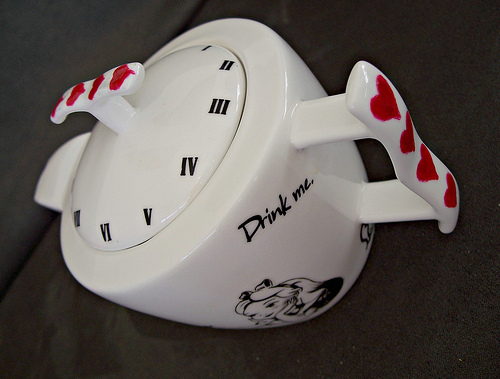 But I like the reference to the time on the lid and the hearts on the handle. 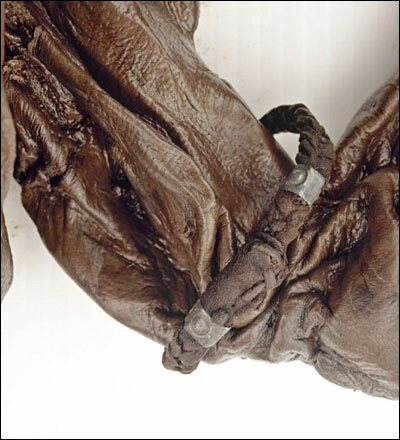 The peat bogs of Ireland hold many treasures and are a rich source of bog bodies. 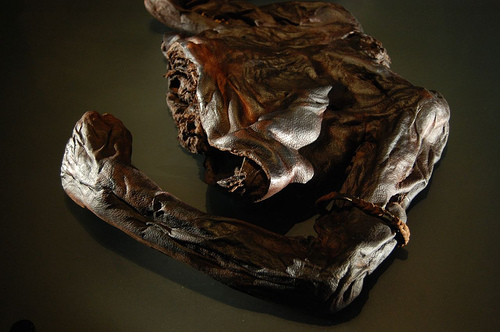 The properties of the peat preserves these ancient peoples – even the contents of their last meal. 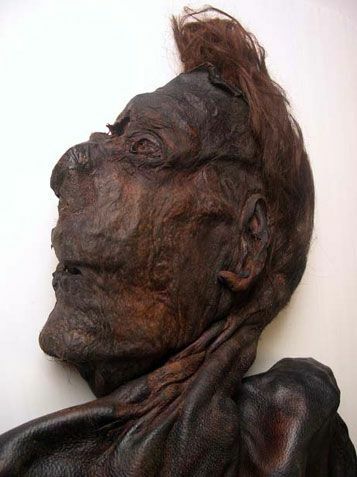 In 2006 two bog bodies of men were found and displayed in Dublin. 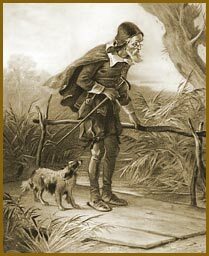 One, a giant of a man (6ft 6in) had manicured nails, he was called Oldcroghan (after the place he was found). The other, (Clonycavan man) measured only 5ft 2 in and had a piled up hair style (just like me – and about the same height too!). To hold this hairstyle together, he wore a kind of hair gel! And they women are vain! Both men seem to have been part of elite, not manual labourers: both were murdered. the whole article about them, which makes interesting reading. But it isn’t only men who are found in bogs. 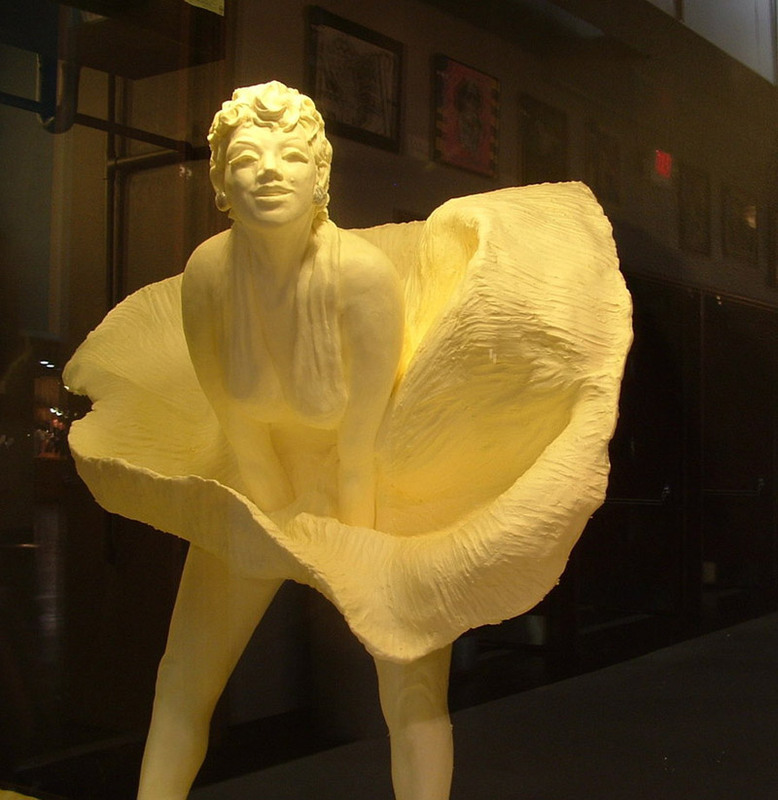 There is Meenybradden woman. She was found in 1978 in a peat bog. Her body was wrapped in a woollen cloak and does not appear to have met a grisly end. Her age is estimated to be between 25 and 30. 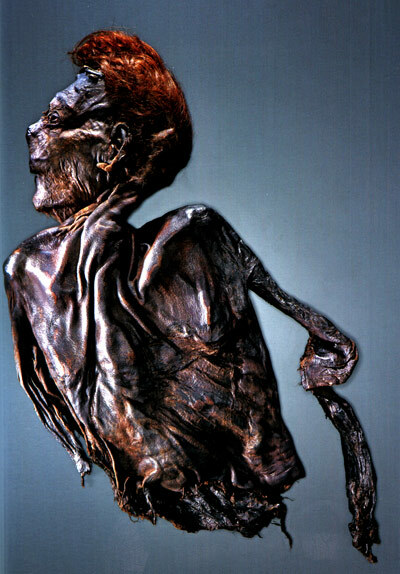 She was at one time the best preserved body – until the body got damaged in the deep freeze! Unfortunately I can’t get a decent image of what is left of the woman. 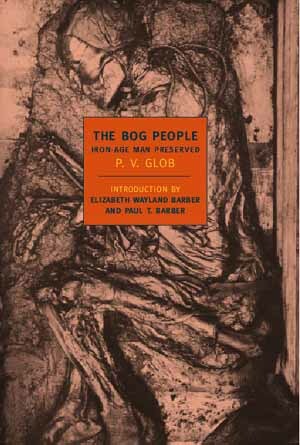 Bog bodies are fascinating, they can tell us so much about ourselves and how we lived. A lot have been destroyed (unintentionally) by peat cutting machinery, but there must be lots lying silently, more just waiting to be discovered. 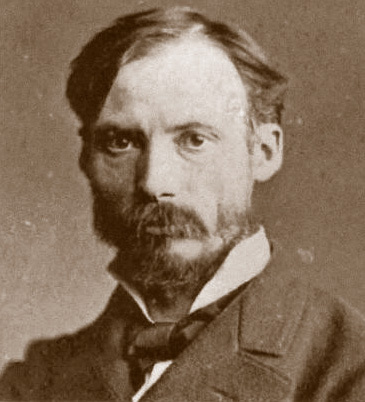 Today is the birthday of French Impressionist painter Pierre-Auguste Renoir (b. 1841- 1919). 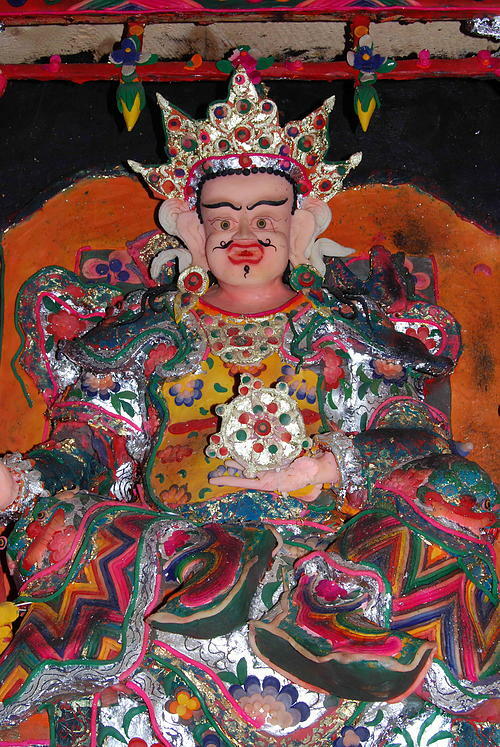 He originally started his artistic career as an artist in a porcelain factory. His first exhibition was in 1864 at the Paris Salon and his early work portray scenes from life. But real recognition came 1874 where he exhibited 6 paintings in Paris at the first Impressionist exhibition, and two paintings in London. 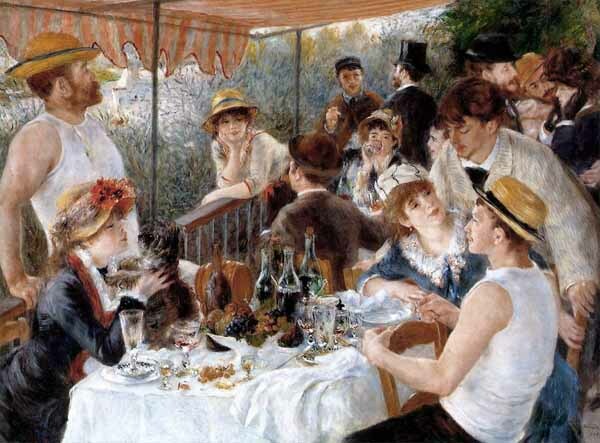 His famous fellow Impressionists include of course Monet, Bazille and Sisley and Pissarro. 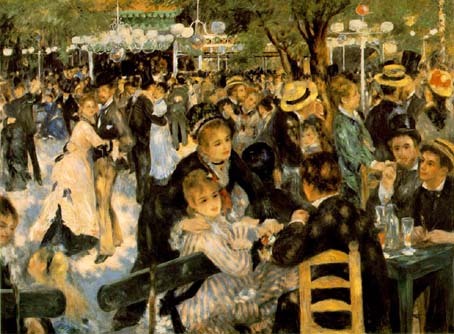 Impressionism not only embraced art, it also encompassed music. It was a massive movement established 1867 – 1886 and tried to capture the effect of light and colour. 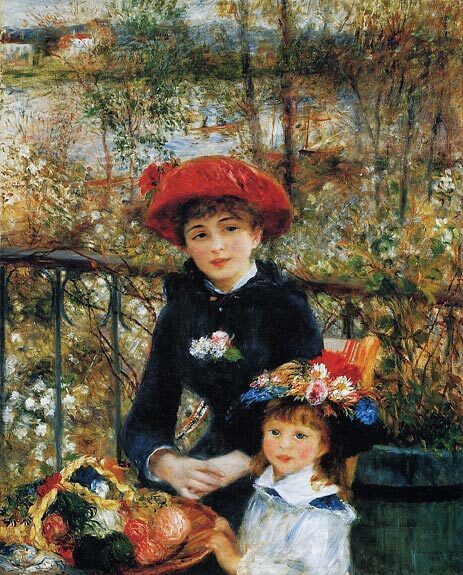 Renoir admired Delacroix use of colour and his early paintings reflect this. 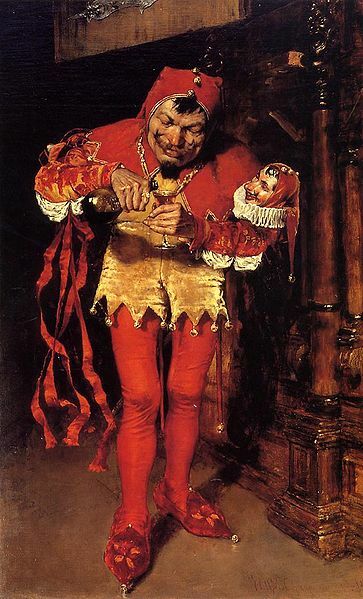 He also admired Courbet and Manet – and especially Boucher. 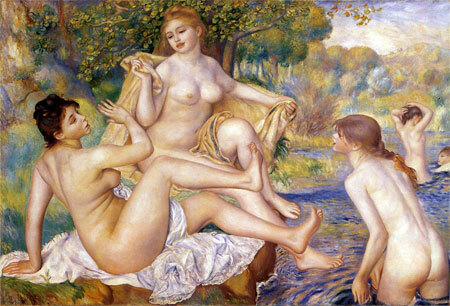 Renoir’s use of colour and light are his trademark. He loved to paint outdoor scenes en plein air. He did return to Classicism in later years and concentrated more on his drawings. 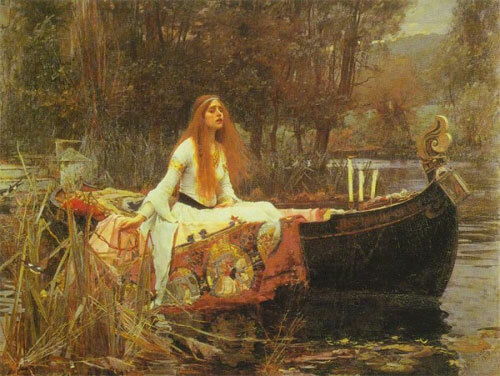 But after 1890, his style changed again, he concentrated more on the domestic theme and nudes. Although crippled with arthritis in later years, which restricted his movements, he adopted to this by having a brush strapped to his stiffened paralysed fingers. It was in this period of his life that he began sculpting with Richard Guino. 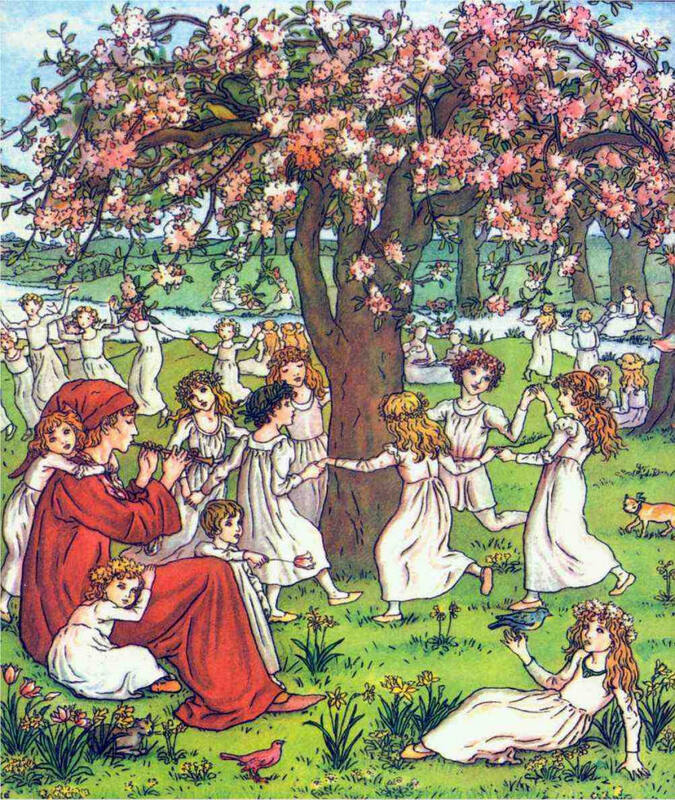 His paintings – of which there are several thousand, are very much-loved by most people and have been reproduced continuously. I’ve been very busy at the moment doing all sorts of things. Some of it involves getting my house straightened, which is boring, boring, coconut flooring. 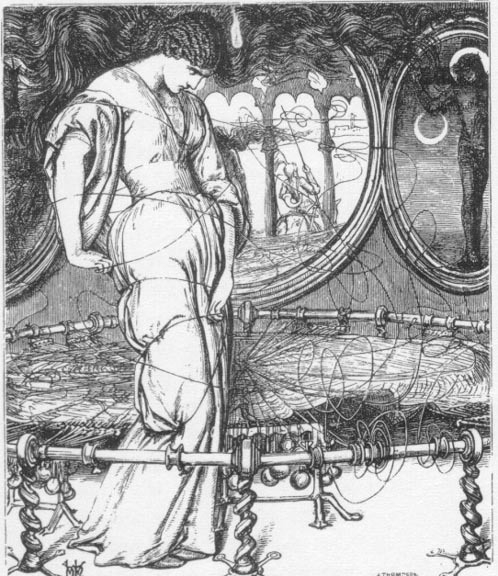 Still blogging on Bookstains (not as much as here) and have written quite a few poems lately (my Arachne rising seems to have arisen again after all these years!). It may be fun (for me) to get some very early work out and look back on the airy fairy stuff I did in my teens (here’s a post about an early influence) and contrast them with some not very pretty punk lyrics…er ‘The Life of Charlotte Bronte’ springs to mind and would not win me many Bronte fans lol! another one was ‘I Trouble’ and ‘Voodoo dancing’. I wonder what happened to them? I might actually come across them in the sort out. If I do, I’ll put them on Bookstains for a bit of fun . 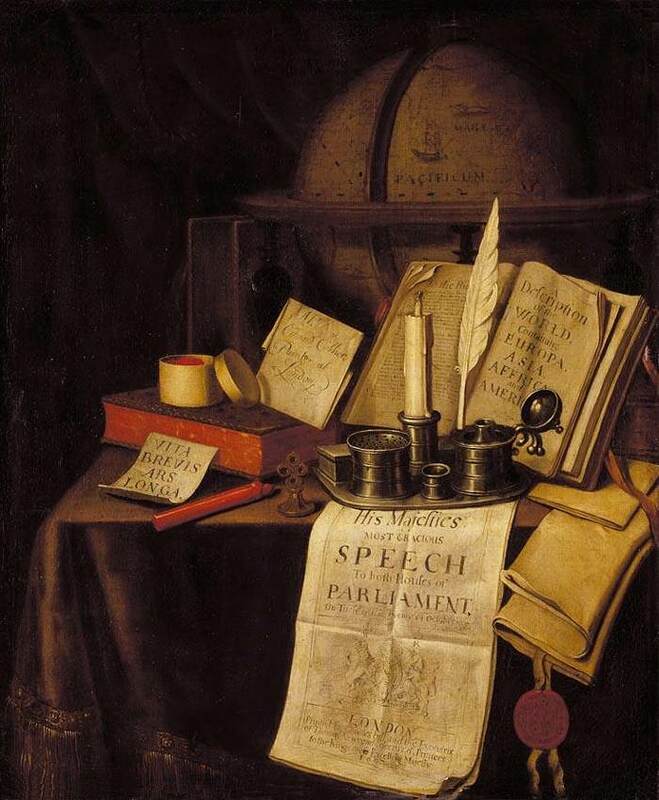 I’m experimenting with different types poems at the moment and enjoying it – which is the whole point of my blogging! It’s good to stand back from time to time and summarise your thoughts and these types of posts help me do just that. I really need to neaten this site up too – there’s lots of niggling things I can see, not to mention the erratic formatting that STILL goes haywire from time to time. I keep telling myself that I should change my theme – but I like it too much, so I must persevere. Blogging is taking up quite a bit of my time (well, the way I’m doing it), I must admit I have spent rather a lot of time on some excellent blogs as I love reading (and seeing) and commenting on what others do. I fullly intend to keep my daily blogging up: I have promised myself that I will post every day this year and I want to keep to this. 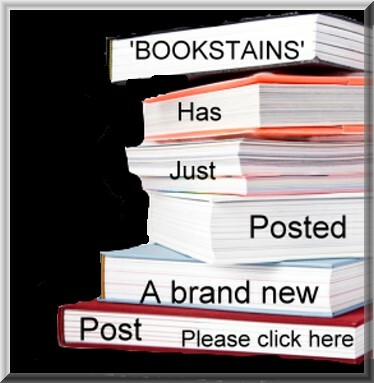 I want to concentrate on my Bookstains blog too, continue to write a bit of poetry, carry on my book reviews and challenges. And I’m still working on a separate place for my personal art which shall be launched this year. So on with the motley ….lots to do eh! I’ve read rather a lot of poetry lately. Mostly off some excellent blogs that I have discovered. I used to write quite a bit myself. I still do occasionally (usually if I’m a bit squiffy). Unfortunately, when I come to read it the writing is very scrawling and almost ilegible. This seems to be a quirk peculiar to my handwriting in general. I start, nice and neat, then the more carried away I get, the more erratic the writing gets. 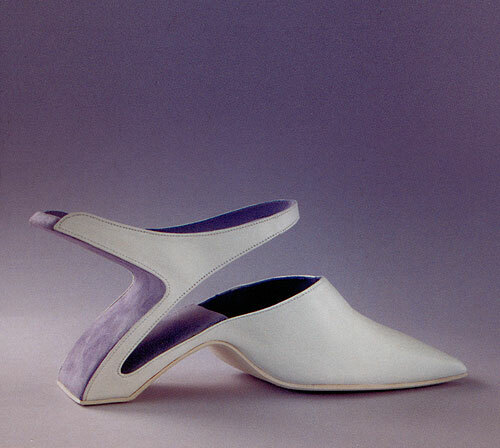 In fifty different sharps and flats……..
Weird and wacky design: Walk a mile in these shoes? 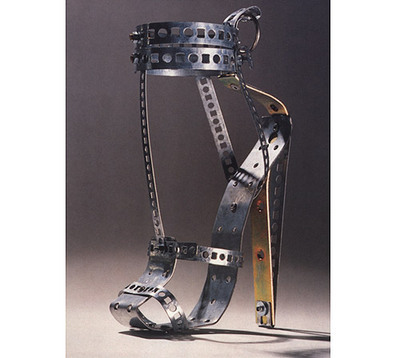 Now I really like these metal shoes! 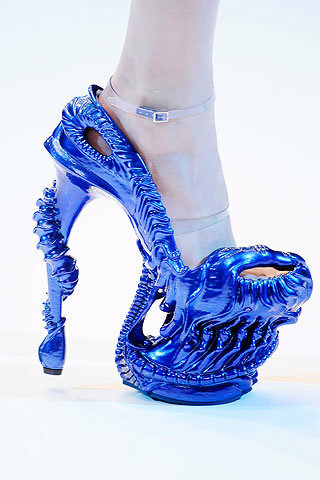 They would look fantastic – but I should think that they would be pretty uncomfortable to wear. They are the sort of thing the H.R. 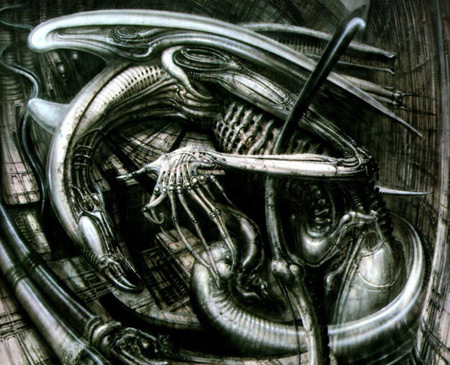 Giger would design (must do a post on that artist). He did the visual effects on the film Alien for which he won an Academy Award. Ideal for a female alien perhaps? Do they have real feet? If so – how many? I don’t think you would be walking very far at all in the last shoes. 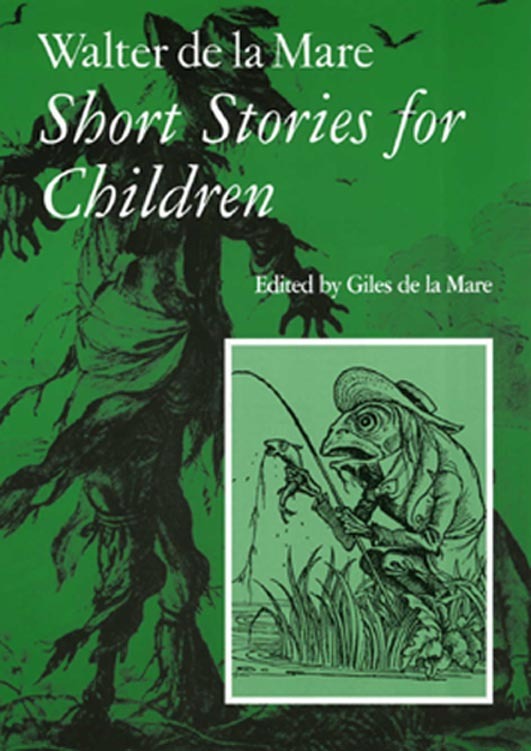 the nursery rhyme, by the way has its foundation in Kings Charles 1st – the crooked man being the Scottish General Alexander Leslie. 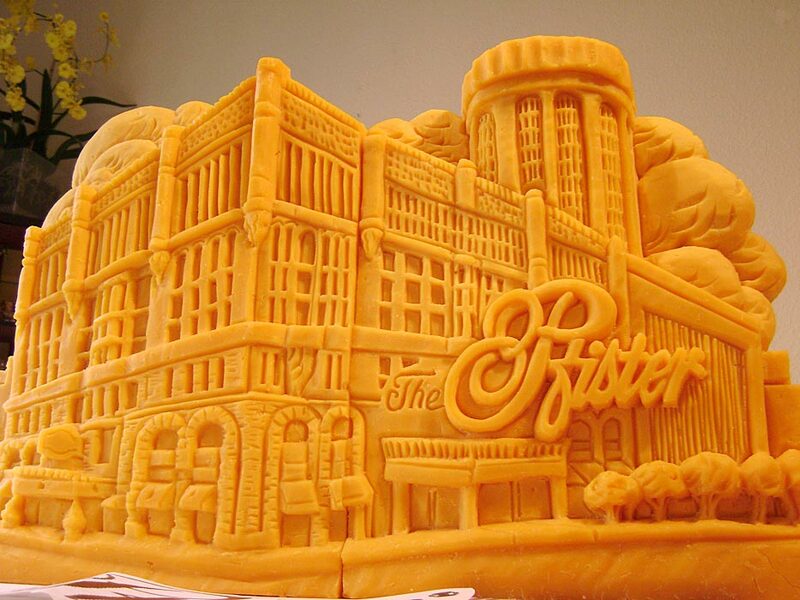 It must be hard to work with the soft consistency of butter or cheese. A certain temperature must have to be obtained surely? Also, I would conditions would have to be right to display these delicate objects. But what about the waste? 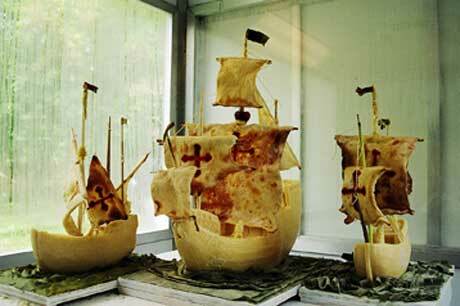 Well here’s a film about what they can do with sculpture once it’s outlived its use – make sustainable fuel! 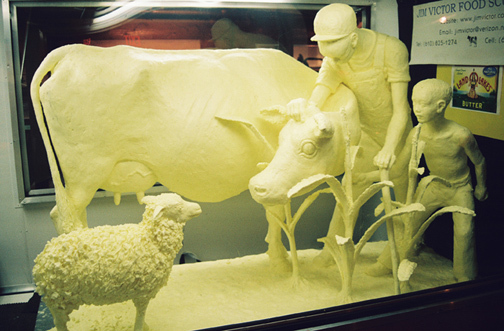 What a great idea eh Everyone can enjoy the sculpture and it can be recycled!